Whether you live in Boise, Salt Lake City, Spokane, Billings, or any of the surrounding areas, wintertime here can be hard on your senior dog. Like humans, older dogs have a harder time handling the colder temperatures, frigid weather, snow, and ice that accompanies winter. These brisk conditions can make it hard and even painful for your senior dog to walk, go up and down stairs, and perform their normal activities without experiencing some discomfort. Here at Sun Valley Animal Center, the health, happiness, and well-being of your precious furry friend is our top priority. 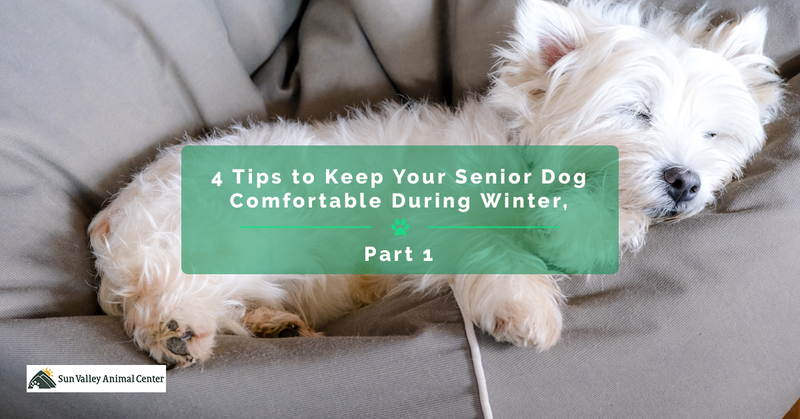 Today, the friendly team at our veterinary hospital will share with you four ways to keep your senior dog comfortable all winter long. Concerned your dog has an injury or condition that pet surgery can address? Call or click to set up a consultation with one of our renowned pet surgeons to see is a surgical procedure is ideal for your pet. It’s essential to keep your senior dog active, even during the cold winter months. When your dog remains inactive, this can worsen joint and muscle stiffness, which can enhance their pain and discomfort while limiting their mobility. Plus, keeping them moving can help with weight management, which can also reduce joint and muscle pain. Walking them for 15-20 minutes daily or every other day is a great way to keep them moving. Swimming is another excellent option because it is less stressful on their joints. Search your community for an indoor dog pool and consider trying this form of exercise. Wintry weather causes joint and muscle pain, so it’s important to keep them warm. Whether out on a walk or relaxing in the house, keeping your furry buddy warm can help them stay more comfortable throughout winter. Get your senior dog a doggy jacket that can keep them warm and protected from the elements while outdoors. Give them a nice, cozy bed to curl up in at night or to relax in during the day. A comfy dog blanket can give them extra warmth at night. For short-haired dogs, providing them extra warmth is essential during winter, but even long-haired breeds enjoy a little extra warmth. Senior dogs can sometimes have a harder time going up and down stairs, getting onto the couch or bed, and getting in and out of a car, especially during winter. For dogs that have developed arthritis, a painful degenerative disease that typically affects the joints in their hips, shoulders, knees, and wrists, the cold weather can make their joints more stiff and painful. To make these everyday activities more comfortable for them, consider a ramp to help them get on and off elevated surfaces easier. Limit their stair use as much as possible by setting up a comfortable space in your home that keeps them on one level. Puppies and senior dogs require more vet care than average adult dogs. Preventative checkups and wellness exams for dogs gives your vet a chance to offer any recommendations or specialized treatments that may help your senior dog more comfortable throughout the winter months. Stay in contact with your vet and maintain regular exams to keep them healthy, happy, and comfortable all winter long. Along with practicing these tips, give our veterinary care center a call learn more about our pain management treatments, physical rehabilitation for dogs, wellness care for dogs, and pet surgery for dogs. Here at Sun Valley Animal Center, we’re passionate about helping your four-legged best friend live their healthiest, happiest life, so call us or reach out to us online to plan your visit to our Top Rated Local® animal hospital.